Chopper 5 flew over the Florida Power and Light plant in Riviera Beach and spotted plenty of manatees. RIVIERA BEACH, Fla. — Chopper 5 flew over the Florida Power and Light plant in Riviera Beach on Monday morning and spotted plenty of manatees huddled together to stay warm. Temperatures plummeted into the 30s overnight for many areas of Palm Beach County, the coldest weather of the season. 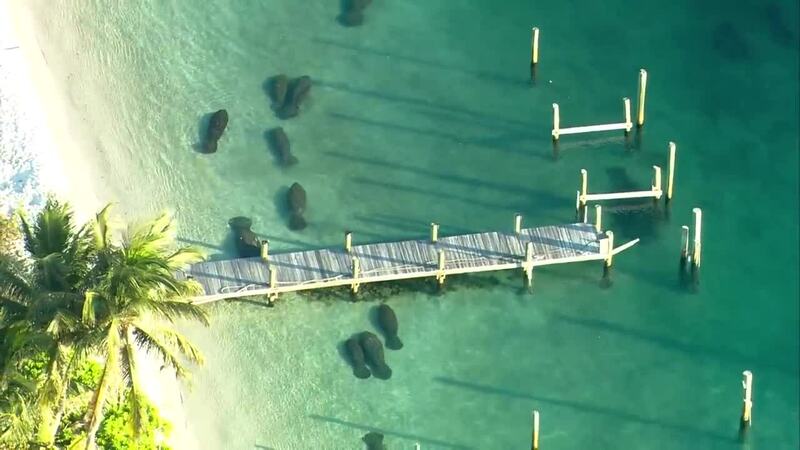 Video from Chopper 5 spotted at least 20 manatees gliding through the crystal clear water. The sea cows love the warm water that discharges from the power plant. The best times to view the manatees are from Nov. 15 through March 31. At the Manatee Lagoon, there is free admission, free parking and an educational center. It is closed on Monday but open Tuesday through Sunday from 9 a.m. to 4 p.m.